More positive Vibes and Happy Holidays from the http://replaceeverything.com/ universe. 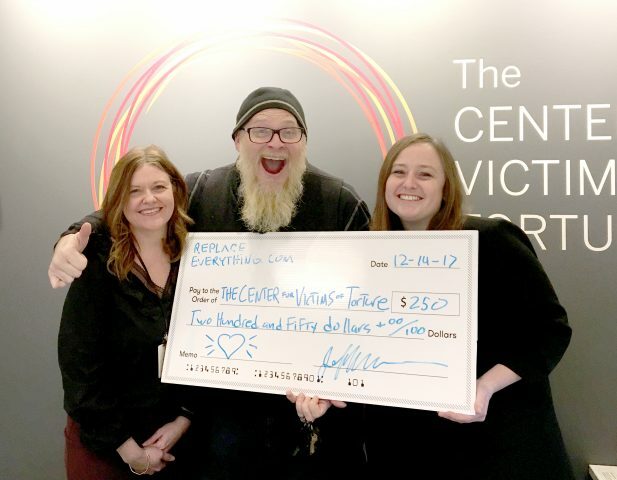 We just cut our first check to our great partners at the Center for the Victims of Torture. These folks do HERCULEAN work for the people that are healing from torture and victimization. And the best part is YOU gave them this funding from purchasing cool design products from Replace Everything. 50% of all profits go to CVT and 4 other great non profits. Big thanks to CVT and to brother Dan Woychick – the MPLS design dude that figured out the tech and the design weirdness that makes this initiative possible. Thanks Dan! And check out https://www.lovemplsparks.org/ to see Dan’s stuff. He sells some of our gear there too – because he’s cool like that. Happy Holidays from the Replace folks!! !